Moving house is all about collecting resources for the big day. Taking care of the logistical and financial aspects of the move can be a daunting process. Aside from hiring a trustworthy moving company NYC, people are usually concerned with finding some budget-friendly options for collecting packing supplies. With that idea in mind, no wonder many people decide to buy used moving boxes. Where to buy used moving boxes or get them free of charge? 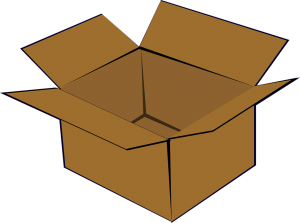 Truth be told, there are so many cost-effective ways to obtain a wide range of cardboard moving boxes NYC. Provided that you’ve started organizing your move well in advance, you will be able to score some free moving boxes as well. If you are moving on a tight budget and need to keep track of your expenses, free of charge moving containers are your best ally. Considering all moving associated costs that tend to pile up, the possibility to get free moving supplies can be a breath of fresh air. As it turns out, there are several places that are likely to give away cardboard boxes of various sizes. Grocery stores, bookstores, and restaurants are the best places to start your quest. Talk to the store managers as ask politely if they could give you some of their extra boxes. If you are a good planner and you start your preparations early, chances are you will be able to take advantage of various sources of free moving boxes NYC. 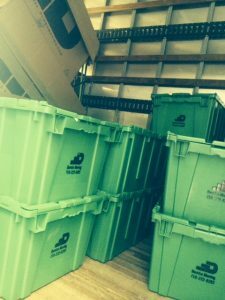 Plastic moving bins are considered as an eco-friendly alternative to the traditional cardboard moving boxes as there is no waste once the move is completed. Those who are looking to reduce their moving footprint on the environment may want to find some more sustainable solutions. As it turns out, renting easily stackable, sturdy moving boxes come with a number of benefits. To start with, plastic containers are usually dropped off at your residence and picked up at the agreed time. And the best part is that you don’t have to deal with moving leftovers. As a result, you will reduce the negative impact of the move and make your relocation more Earth-friendly. While it’s always a great idea to think about sustainability, when weighing whether to buy used moving boxes or the new ones, safety, efficiency, and affordability are usually the deciding factors. To buy or not to buy used moving boxes? Going for used moving boxes is certainly a cheaper option, but it comes with some potential risks and inconveniences. 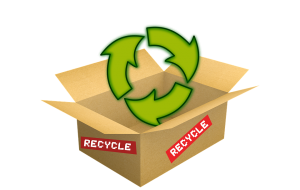 It’s great to re-use boxes rather than throwing them away, but you should be aware of all risks that may come along. As we all know, cardboard breaks down easily, so you need to get boxes in really great condition. Also, when it comes to moving fragile and valuable items, even cardboard boxes in good shape don’t provide sufficient protection. In addition to that, you won’t be glad to hear that unattended moving boxes are a real sanctuary for different insects and pests. What better place to hide than a pile of cardboard moving boxes in a dark storage facility, garage or attic? So, moving them to your new home along with your precious items is probably the worst-case scenario you would like to avoid at all costs. Also, if you decide to buy used moving boxes or get them for free at the nearest grocery store or supermarket make sure there are no food leftovers and spilled liquids. As it turns out, those factors can compromise the integrity of the boxes so make sure to take all aspects into account before making a final decision. What to do with moving boxes after the move? Give away boxes in good condition. It may be a good idea to offer boxes in good condition to the people planning a household move. Re-sell reusable moving containers. Advertise your boxes online, via social media and other internet channels. Cardboard boxes in excellent condition may be worth more than you know. Luckily, there are people who want to buy used moving boxes and save some time and money down the road. Recycle after the move. Contact the nearest recycling center to arrange for the pick-up of your boxes. Also, you may have to drop them off to the designated location. Re-purpose your moving boxes. If you’ve decided to save moving boxes, there are ways to put them to good use. With a handful of options, you may give them a new life once your household move is over. Once you spread the word about the upcoming move you may come across different tips, suggestions and even offers. Chances are some of your close friends or relatives have gone through the household move recently. Their experience can help you better understand all stages of the move and make the most of the period leading up to moving day. They may share some useful information about affordable moving companies NYC, moving day issues, packing and unpacking guidelines. Also, it’s always a good idea to consult online moving reviews when researching reputable moving companies or quality cardboard box providers. Luckily, people tend to share both positive and negative experiences, so you will find a lot of significant guidelines that may ease your research. Remember that you shouldn’t base your final decision on the price alone, as there are other factors to consider. Choosing the lowest moving quote can be tricky in so many different ways, so make sure to do a background check before committing to any of them.